Though the magical colors lasted for a short few days, the criticism of the Starbucks Unicorn Frappuccino was not all rainbows and butterflies… But what stirred such controversy of the colorful frappe and off-the-menu lemonade? Find the truth behind the Starbucks Unicorn Frappuccino and Lemonade here, along with a healthy alternative to that highly sought out frappe! According to Starbucks, the Grande (16-ounce) Unicorn Frappuccino made with whole milk and added whipped cream supplies 410 calories, with approximately 35 percent of calories coming from fat and 60 percent coming from carbs. Dig a little deeper, aside from the natural carbohydrate from milk, the frappe contains 59 grams of added sugar. (Especially after deciphering through Ingredients label filled with the recurring words “sugar” and “syrup,” the large volume of sugar is not so surprising.) And while the Starbucks Unicorn Lemonade (a “secret” menu item) does not expose its nutritional contents, it would not be too surprising to have similar sugary characteristics, just without the added fat from milk and whipped cream. To put the sugar content into better perspective, the 59 grams of sugar in the frappe is comparable to three packs of Reese’s peanut butter cups (66 grams of sugar), two cans of Mountain Dew (62 grams), and six Krispy Kreme doughnuts (60 grams). 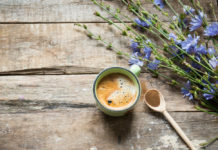 But to better stress the health concern of such a large sugar supply, the American Heart Association (AHA) encourages men to consume no more than 36 grams of added sugar per day while women are limited to 25 grams. (The Starbucks Unicorn Frappe almost doubles the sugar recommendation for both men and women!) And while sugar may be desirable in the moment, too much of it can lead to weight gain and obesity, along with increasing the risk of heart disease, diabetes, and other health alarms. 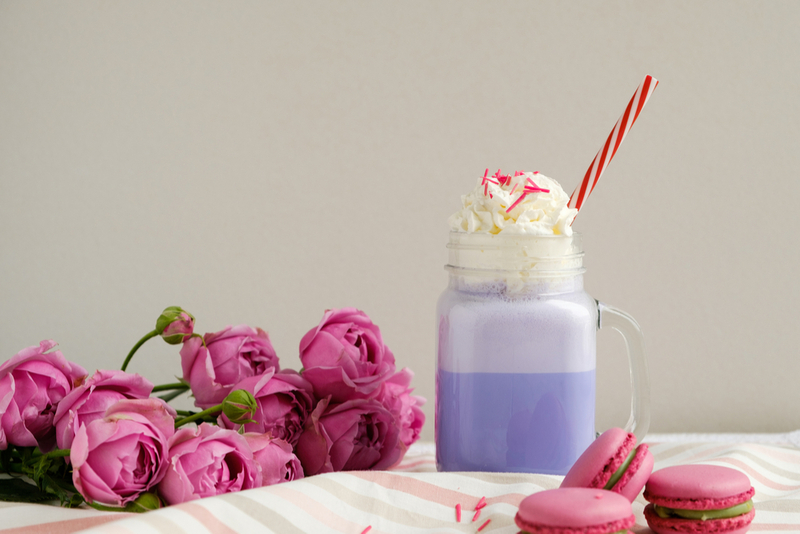 Have your beloved Unicorn Frappe and drink it, too! Clean up the Ingredients label by whipping up a magical, Unicorn Frappe in the comfort of your own home. Containing only 260 calories, half the amount of carb, and an ample supply of protein (18 grams! ), Balance by bistroMD’s Unicorn Frappe is nothing short of magical! Separately mix the two layers in a food processor or blender until smooth. Since the Frappuccino is touted to start sweet and transform into a sour flavor, pour the pink layer at the bottom, as it offers natural sweetness from the fruit and will be consumed first from a straw. Top with the blue layer for a finishing tang from the the Greek yogurt and lemon, but feel free to layer and swirl the layers as desired. Top with optional fresh whipped cream, berries, and shredded coconut for bonus desirability and magical colors!